It’s not often bottles of liquor venture into an academic setting, but that’s the case in a new class where alcohol is the focus. The fall 2018 semester is the first term for the Special Topics in Bartender/Mixologist class (BTND 1391) which is only offered on SE Campus as a part of the hospitality program. In addition to making drinks, students learn drink recipes and the history behind them. But not just anyone can enroll in the course, SE student Tani Bostick said. Students learn about 10 other drink recipes a week. Bostick isn’t wasn’t sure she wants to be a bartender, but the class has offered her practical experience so far, she said. All of the practice is done with colored water in liquor bottles, SE hospitality management instructor Talia Dancer said. For example, Crown Royal is a brown drink, and so brown food coloring is put into the water. Alcohol is used sometimes, she said, adding that taste testing is also a part of the class, which meets once a week and typically one alcoholic drink is served based on a recipe of the week. 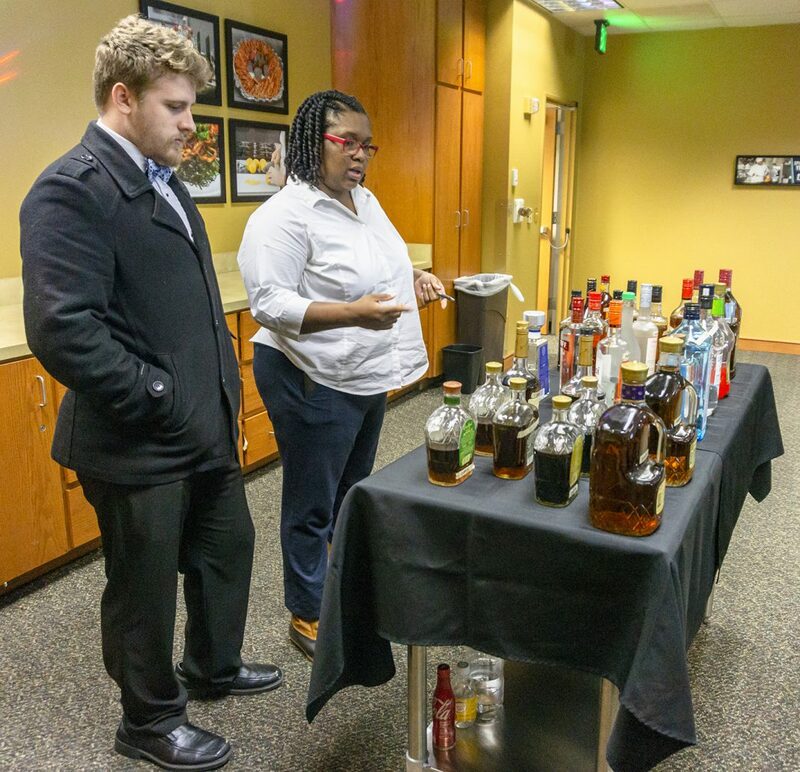 “What we do is we introduce the recipe, we talk a little bit about the history of that liquor or even the history of the actual drink and then from there we get two volunteers to actually make the drink for the class,” Dancer said. On days the students sample alcohol, breathalyzers are available to record their blood alcohol content. SE and NE student Sam Bailey said he finds it enlightening to use the breathalyzers to see how alcohol affects him. Bailey takes all of his other classes on NE but found out about the bartending class through the catalog and decided to take it even though it was on SE. “I was like ‘Oh, bartending class, that’d be fun to see how much my friends are poisoning me,’” he said. Bailey said one of the biggest challenges for him is mixing drinks in a timed environment such as when given two minutes to make two drinks. “When you think you know all the recipes, you don’t. It just goes away,” he said. The classroom is currently set up in The Magnolia Room ESEE 1306 with the intention to find a permanent classroom by or before next semester where bars and other equipment can be installed. The students this semester have made do with counters along the walls of the room, SE student Emily Churchman said. “I think once we have a dedicated classroom and then bars, everything will be already set up, and it’s not going to be as difficult,” she said. Each class where students mix drinks requires a bit of additional set up but said it works fine for now. “It’s fun every class. We’re doing something fun and learning a whole lot of new things that we didn’t know before and getting to drink,” she said. The class is a part of two new certificates, beverage management I and II. The certificate applies to career opportunities such as bartender, wine steward, craft cocktail mixologist and beverage retail manager. For students interested in taking the class, Churchman said students should expect actual class work in addition to mixing and drinking including memorizing lots of recipes and quizzes. Previous articleEditorial – Are Americans numb to mass shootings?